The Arts & Crafts movement grew out of several related strands of thought during the mid-19th century. It was first and foremost a response to social changes initiated by the Industrial Revolution, which began in Britain and whose ill effects were first evident there. Industrialization moved large numbers of working-class laborers into cities that were ill-prepared to deal with an influx of newcomers, crowding them into miserable ramshackle housing and subjecting them to dangerous, harsh jobs with long hours and low pay. Cities likewise became doused regularly with pollution from a bevy of new factories. Often called the first Arts & Crafts building, Red House was appropriately the residence of William Morris and his family, built within commuting distance of central London but at the time still in the countryside. It was the first house designed by Webb as an independent architect, and the only house that Morris built for himself. Its asymmetrical, L-shaped plan, pointed arches and picturesque set of masses with steep rooflines recall the Gothic style, while its tile roof and brick construction, largely devoid of ornament speak to the simplicity that Morris preached and its function as a mere residence, though the interiors were in places richly decorated with murals by Edward Burne-Jones. The house represented a sharp contrast to suburban or country Victorian residences, most of which were elaborately and pretentiously decorated. Its location allowed Morris to remain in touch with nature, away from London's dirty, polluted core. The design, which included unusually large servants' quarters, spoke to Morris and Webb's budding Socialist inclinations towards erasing class distinctions. Unfortunately, the long hours that Morris spent commuting proved too burdensome for his productivity, and after only five years in the house he sold it and moved his family into London above the shop for his firm. The Tulip and Rose curtain exemplifies the kinds of textiles and wallpaper designs produced by Morris' firm beginning in the 1860s. The dense, precisely interlocking pattern of the wool fabric, using curved and exaggerated forms of plants, flora (and sometimes fauna) became a hallmark of Morris & Company's fabric and wallpaper products in the 1870s and '80s. Unlike Morris' earlier designs, which featured more naturalistic imagery, this textile demonstrates his move beyond emulation towards a sense of abstraction during his mature career. The flattened forms and the emphasis on line anticipate the stylization of nature later used by Art Nouveau, and calls attention to the nature of the wool's rough surface texture, thereby revealing the honesty in materials. Furthermore, the "hanging" quality of the imagery of plants and flowers speaks to the way vines cover an entire exterior wall surface - much like the curtain is supposed to cover the entire plane of a window, creating a consonance between the natural elements and man-made articles, in effect bridging or blurring the boundary between the natural world outside and the interior, even when the curtain is completely closed. As much as the forms here look forward towards Art Nouveau, their flattened quality also looks backwards towards the forms of plants and living elements as depicted in Gothic stained-glass windows, and the curved linearity of the plants could also be said to mimic the forms of Gothic tracery. In this sense, the textile is as much revelatory of Morris' background and love of the Gothic as it is a forward-looking formal experiment. 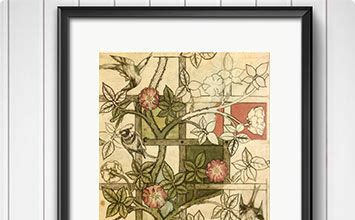 The tomes that William Morris produced during the last six years of his life were the epitome of the luxurious pieces manufactured by his firm. They were designed as art objects to be experienced as much as books to be perused, so much so that it is difficult to read them straight through like an ordinary text. The decoration is so lavish and elaborate, overwhelming the printed text to such a degree that one is compelled to stop at every pair of pages and examine it with care before attempting to continue with the narrative (put forth in generally small type). One is immediately struck by the sheer amount of labor involved in creating the plates for printing, the typesetting, the process of making the paper and the binding, along with the cover decoration. The Chaucer, which was the jewel of Morris' volumes made at the Kelmscott Press in an edition of only 425 copies, resembles the ancient medieval colophons with painted calligraphic script and thick binding. The binding is secured when the book is closed with latches, suggesting that the process of reading the work is akin to opening a kind of sacred tome or a treasure chest and that what is contained inside is extremely valuable. The choice of Chaucer, a medieval English author, for the text, is representative of both the connections of the Arts & Crafts with the Middle Ages and Morris' own deep appreciation of literature (he was offered the post of Poet Laureate of Britain the following year but turned it down). Ironically, despite Morris' desire that a book like this would produce joy and pleasure in an ordinary reader, it paradoxically was never accessible to any but the wealthiest of his clients, and arguably its overwrought design renders it difficult to comfortably handle or digest for simple legibility. The subway tile here represents the way mass production became a hallmark of the Arts & Crafts movement in the United States and ultimately put an end to the large-scale use of handcraft by most design firms. Grueby, founded in 1894 in Revere, Massachusetts, was known primarily for its production of art pottery vases, often using the matte cucumber green glaze that can be seen here as well. But the company was also renowned for its architectural tiles, which it instead produced in molds. In 1904 the company, which had built a name for itself by earning several gold medals at international fairs, was awarded the contract for the pictorial tile revetments in the stations of the new Interborough Rapid Transit lines of the New York Subway. This was not enough, however: Grueby's mass-production competition forced it into bankruptcy in 1909, and after a decade of instability, the company closed for good in 1920. The tile is significant for the Arts & Crafts in many respects. The beaver, like most of the other stations' tiles produced by Grueby, recalls the naturalistic or rural imagery characteristic of the movement and provides a softer antidote to the otherwise industrial character of the stations (emphasized by the natural colors). Here, the beaver has a double meaning, as Astor Place was named for the Astor family, who had built their fortune in part through fur trapping of beavers in the Pacific Northwest; on the other hand, "Astor" itself is nearly synonymous with the Latin word for beaver, "castor." A simple frame with a geometric design and low garland relief surrounds the beaver, emphasizing the flatness of the surface. If the bungalow is the quintessential Arts & Crafts house, the Gamble House could be described as the perfect "overgrown" example. Designed by the architectural firm of the brothers Greene & Greene, Massachusetts transplants to southern California, for the eponymous executive of Procter & Gamble, the house demonstrates the way that the movement's notions of simplicity and homeliness were transformed into the preserves of the upper classes. It remains the best example of the Greenes' architectural work and is sometimes described as an exemplar of the Western Stick Style. The Gamble house exhibits consonance with nature in nearly every respect. Its low, horizontal profile is exemplified by the covered second-floor porch and wraparound terrace extending from the front entrance to the back garden. The painted olive hue of the shingle siding almost seems to blend with the verdant trees and is offset by the stained wood of the frames for the doors and windows. This brown hue extends to the interior and multiplies with inlays in various surfaces, thus creating a sense of continuity between outside and inside. Such harmony is finally reinforced by the stained glass of the front door, which features imagery of a Japanese black pine, acknowledging the house's location on the Pacific Rim. The interior, meanwhile, exudes a gentle warmth and sense of informal comfort despite not being brightly lit, a quality highly desired in an Arts & Crafts residence. Finally, the Greenes designed the house with a painstaking attention to structural honesty, extending the rafters underneath the roof to the ends of the eaves and exposing the joinery on staircases, beams, and posts on the interior. Newcomb College Pottery is emblematic of a well-known regional strain of the Arts & Crafts movement, and the most famous of those located in the American South. It also bears the distinction of being one of the few Arts & Crafts centers that was directly attached to an institution of higher education, the women's college of Tulane University. This vase, painted by Sarah ("Sadie") Irvine, the best-known of the Newcomb Pottery designers, shows the most popular theme for the vessels they produced: the "Moonlight and Magnolias" imagery of broad-canopy live oak or magnolia trees, adorned with moss drooping from their branches, silhouetted against a night sky with a full moon. The most naturalistic and least stylized of the various Newcomb Pottery designs, this imagery clearly roots the piece in the region of the lower Mississippi River valley, where magnolias are abundant, as if to advertise directly its origin. But as much as the vase reveals about the region where it was made, it also discloses how the large artistic American Arts & Crafts enterprises created a brand for their products that simultaneously diminished the identities of their individual artists. Although Irvine was one of the most important painters of Newcomb vessels, working there from 1908 to 1929 before serving as a studio art instructor until 1952, the institution did not publicly promote her talents. And while her painted vessels are often marked and she was able to sell individual pieces, women were barred from the initial stages of the work's creation: school policy was that a "male potter would be needed to work the clay, throw the pots, fire the kiln and handle the glazing." It was Joseph Meyer's job to create the unfinished vessels and plates for the women to decorate; he in turn received the credit for Newcomb Pottery when it won awards at major international expositions. Voysey's sideboard illustrates well many of the tenets of Arts & Crafts furniture. The straightforward design appears so homely that one might almost mistake it for a piece of folk art. The sideboard rests on four posts that appear almost to be too thin to carry its mass; they are extremely plain, as not even the feet include fittings, and terminate in shallow circular platforms that may have been intended to hold candles, underscoring the anti-modern tenor of the environment this piece was meant to occupy. The wood, fittingly, is oak, a very common selection for Arts & Crafts furniture, which has been hewn in order to expose the grain, and stained to visually emphasize the material's texture. The organization of the sideboard's storage is honest and simplistic: a cabinet containing possibly a shelf, a counter, and a shelf above attached to the back. Virtually nothing about the piece is hidden or complicated. The only ornament attached to the sideboard consists of the prominent dark brass hinges on the cabinet doors, which terminate in heart-shaped cutouts. They appear in some sense to be the only part of the sideboard that holds the piece together, bolstering the sense of solidity and sturdiness, while their curves provide an antidote to the otherwise severe straight lines. The hinges appear almost as if they were stolen from a Gothic cathedral door and repurposed, giving the sideboard a deceptive air that it is older than it really is and underscoring the connection with the Middle Ages, from whose aesthetics the Arts & Crafts was derived.